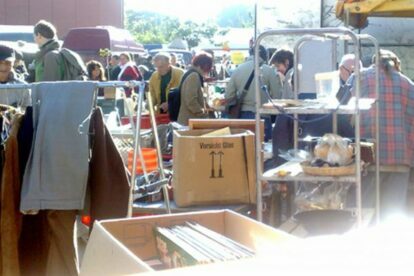 Every Saturday very early in the morning the place around the old slaughterhouse, the gallery of the “Schlumper” (art from handicapped people) and the Knust (concert hall and bar) become a flea market. It’s a vibrant place which is calm & relaxing. You’ll see a lot of tradespeople trying to sell their old, rare, extraordinary hodgepodge, kitsch and curiosities. On this expedition through history, you can find art, clothes, affordable furniture and sometimes practical stuff old and new. Attention should be paid to the selection of the Flohschanze. You won’t find any brand-new-traders or special items like at other flea markets. Here are people, who have cleared out their houses, and display their wares on a wallpapering table or a blanket on the ground. Just for this event they are rigorous traders that have fun selling their wares with their friends in an typical rummage atmosphere. BTW: Every week there is a street musician with guitar playing his owns versions of popular old songs, sometimes you need time to realize which song it actually is. I give him always money and strongly believe that he brings luck for the day! another BTW: check out the Photoautomat (check the Photoautomat article) right beside the flea market for a good souvenir of the day.